Click the "Show a desktop alert" box on the Actions tab of the Event Editor or Reminders tab of the Task Editor. Click the "Show a desktop alert" box on the "Event Defaults" tab of the Event Calendar Properties window or "Task Defaults" tab of the Task Calendar Properties window. Events and tasks can be set up to display a desktop alert reminder type. Desktop alerts will display in a small window in the lower right corner of the screen, similar to the alert that some email programs show when a new email arrives. An example desktop alert is shown below. To enable a desktop alert reminder, check the "Show a desktop alert" box in the list of available actions on the Event Editor or Task Editor window. This will allow the desktop alert options to be viewed or modified as described below. There are two tabs for configuring the desktop alert settings. The "When" tab allows scheduling of when the desktop alert should appear. The "Content" tab allows selection of what the desktop alert should contain. You can specify the amount of time before the event or task that the desktop alert should be first displayed. Desktop alerts can be automatically snoozed. This feature could be used if you're away from your computer but within hearing distance, since desktop alerts can also play a sound. 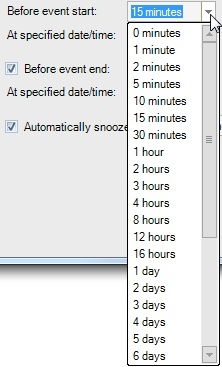 When automatic snoozing is selected, the desktop alert will be displayed for the amount of time specified. It will then be snoozed and will reappear and replay its sound after the specified snooze time has been reached. In the example image above, the desktop alert will be displayed for 30 seconds. After 30 seconds, it will automatically snooze for 5 minutes. You can select a time from the drop-down list, or type in your own value. Reminder sharing options will be displayed if the reminder is associated with an event belonging to a calendar that is shared or published. These options allow you to choose whom should see the reminder. You can also choose to not have the reminder shown to yourself. Use the "Share reminder"' checkbox to allow other people to see the reminder. When checked, two additional options will be displayed for tailoring how the reminder will be shared. You can play a system sound or a specific sound (wav) file when the desktop alert is displayed. This sound will play each time the alert is displayed, including after it has been automatically snoozed. To choose a system sound, select the "Play system sound" option, and then select a system sound from the drop-down list. To choose a wav file, select the "Play sound file (wav)" option. A path to a sound file can either be typed in, or you can select the "..." button to browse for a sound file. You can also click the drop-down arrow to access a list of recently used sound files. The "Loop" box can be checked to make the wav file continuously repeat until the desktop alert is snoozed or dismissed. Desktop alerts can include a thumbnail image. You can select any image, it will automatically be scaled to fit in the small desktop alert window. For best results, use images that have the same width and height. You can preview what the desktop alert will look like by clicking the Preview button. An example preview is shown below. The desktop alert's menu, pin, and snooze options are not available in the preview.